Woodstock has the historical cachet. The Last Waltz boasts Martin Scorsese behind the camera and features The Band’s final performance with Robbie Robertson. Gimme Shelter captures the Stones at their peak, along with a freakin’ on-camera murder. A convincing case could be made for any one of these as the greatest concert movie ever shot—but it would be wrong. I’m not much for categorical pronouncements, but here’s the exception: There never has been, and in all likelihood never will be, a more glorious intersection of live music and cinema than Stop Making Sense. 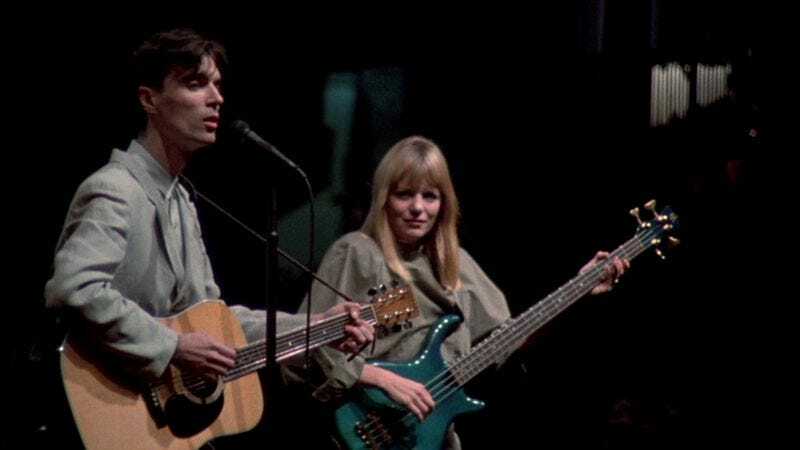 Shot by Jonathan Demme during Talking Heads’ 1983 tour supporting Speaking In Tongues, it’s the only concert film that transcends the genre’s usual function as a permanent record of a performance, and fashions a hybrid work of genuine art. David Byrne’s inventive conceptual ideas, designed explicitly for the stage, serve as a starting point for an experience that simultaneously honors what concertgoers witnessed and creates something new for the screen. There’s truly nothing else like it. Nobody has even tried. Perversely, perhaps, I’d like to take a closer look at its least typical number: the first, “Psycho Killer.” One of Byrne’s many inspired ideas for this tour was introducing the band gradually, one or two members at a time; it takes six songs for the entire ensemble to appear. At the outset, the audience is treated to Byrne by himself, on an enormous but completely bare stage, playing an acoustic rendition of one of the band’s most jagged (and bass-driven) singles. This stripped-down opening serves as a sly bit of misdirection, since the show as a whole is busy to the point of being overstuffed: nine musicians, multiple slide shows, goofy props, bizarre costume changes, even a cameo appearance by a different band altogether (Tom Tom Club). But this solo “Psycho” is also strangely electrifying—so much so that, as much as I cherish the group energy that explodes later on, I also sometimes wish that Byrne had performed an entire set by himself at that age, when his creative vitality seemed inexhaustible. Right from the beginning, Stop Making Sense works as a movie, not merely as the filmed record of a concert. The camera pulls Byrne’s white sneakers from the wings onto the stage, observes as he places a boombox on the ground and pushes play, then drifts up to find him doing that nervous chicken dance at the mic. As the midpoint of his walk, the audience (barely ever seen and rarely even heard thereafter) does the usual sudden whoop indicating that they’ve caught sight of him and now know the show is about to begin. But think about what they’d theoretically be seeing: Byrne following a camera operator moving speedily backward at ground level. Behind-the-scenes footage of shots like this look a little silly from any perspective other than the camera’s; the difference between the crowd’s experience of this moment and our own is vast. But while Demme has redesigned Byrne’s introduction for the screen, he’s also taken care—even if he cheated a bit by including audience noise from an unfilmed performance, as I suspect—to provide a sense of what it felt like to be in the room. Actually, now that I rewatch the number, I see that the audience is much more visible here than they will be again until the final song (“Crosseyed And Painless”). A decision was clearly made to avoid stock shots of cheering fans, but Demme also wants to emphasize a cavernous quality here, to make Byrne look as tiny and solitary as possible. To that end, he shoots him from the very back of the stage, off-center, with the audience visible behind him, then cuts to a shot from the back of the house, centered this time, with the audience visible in front of him. What this juxtaposition highlights is an expanse—a void that needs to be filled, and will be. That sense of a community forming is what gives Stop Making Sense an emotional power that other concert movies don’t just lack, but never even considered as an option. At the same time, though, Demme is too much the humanist to strand Byrne entirely. In keeping with the general policy of not hiding crew members (who move equipment on-camera constantly), several of them enjoy the music from the wings, out of focus in the background, but clearly visible. More cavernousness ensues during the lengthy instrumental jam at the end of “Psycho Killer,” as Byrne stumble-dances all over the stage, by way of reminding viewers that there’s nothing there whatsoever. Though not for long: As he plays a few bars directly to the camera, stagehands behind him set up what I think is the amplifier for Tina Weymouth’s bass. (I don’t play any instruments, so let me know if I guessed wrong.) I confess to being slightly distracted by the blatant continuity error that finds Byrne transported from stage right of the mic to far stage left of it, just before he stops playing guitar and strut-walks his way back to center. But all is forgiven when the song ends in a burst of feedback, the camera follows Byrne back to center stage, and Weymouth is already standing there, bass in hand, ready to shift gears dramatically with “Heaven.” For some reason, the fact that she isn’t shown coming onstage—that the camera doesn’t make a point of announcing her presence, simply picking her up in the background “already in progress”—touches me. It suggests family rather than bandmates, and I submit that family is what this movie is ultimately about. The fact that it’s about anything at all is unique. When it manages to set up a narrative in its first number, that’s miraculous.